According to a discussion with the deputy chief engineer in September 1997, the IVG-1M reactor was completed in 1972 and reached first criticality on 7 March 1975 with a power rating of 40MW. The core of the reactor has 30 cells for fuel channels, one of which is gas-cooled. The remaining channels are water-cooled. According to reports, this reactor was previously run by the Soviet Ministry of Medium Machine Building to fill orders from the Ministry of Defense. It was used primarily for experiments on developing nuclear rocket engine prototype. Reconstruction of the reactor to investigate accidents at nuclear power stations (for example, changing to gas-cooling from a water-cooling system) was stopped in 1996 due to a lack of funds. In 1997, the reactor was in operation for only brief periods, about two or three times per year. According to a 1997 interview with Timur Zhantikin, Director General of the Kazakhstan Atomic Energy Agency, IVG-IM is likely to be shut down due to financial problems. One source identifies another research reactor at this location as the Sphinx, a 200MW channel type reactor. The year of criticality is not indicated. 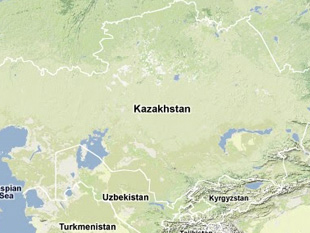 According to the source, the reactor is operated by the Kazakhstan Atomic Energy Agency. This may have been a reference to a planned third research reactor at the Baykal-1 Complex, which was begun, but never finished. For more information, see the National Nuclear Center's description of the reactor. "Tests Conducted Under the Programs of Space Nuclear Power Plant Development," Brochure distributed at the 2nd International Conference on Non-Proliferation Problems, Kurchatov, Kazakhstan, 14-17 September 1998. Gennadiy Chumachenko, "Teleutro," Russian PublicTelevision and Orbita networks, 21 July 1997; "Semipalatinsk Nuclear Rocket Engine Facility Outlined," FBIS-SOV-97-205. "Invitation for Cooperation," an undated National Nuclear Center of Kazakhstan marketing brochure. Emily Ewell, "International Conference on Nonproliferation Problems," NISNP trip report, September 1997, KAZ970900, pp. 10-12. "Transfer of the Research Reactor Highly Enriched Nuclear Fuel to Russia," 2nd International Conference on Non-Proliferation Problems, (Conference Brochure) Kurchatov, Kazakhstan, 14-17 September 1998, p. 14. Emily Ewell, "International Conference on Nonproliferation Problems," NISNP trip report, September 1997, KAZ970900, pp.12, 14. "Transfer of the Research Reactor Highly Enriched Nuclear Fuel to Russia," 2nd International Conference on Non-Proliferation Problems, (Conference Brochure) Kurchatov, Kazakhstan, 14-17 September 1998, p. 14; V. Ganzha et al., "Problems on Shipping High-Enriched Nuclear Materials," abstract of a paper presented at the 2nd International Conference on Non-Proliferation Problems, Kurchatov, Kazakhstan, 14-17 September 1998, pp. 35-37. Emily Ewell, "International Conference on Nonproliferation Problems," NISNP trip report, September 1997, KAZ970900, p. 15. NNC official, Presentation on the National Nuclear Center of Kazakhstan, CNS Seminar for Journalists, Almaty, Kazakhstan, 8-9 June 2001. "Nuclear Safety: Concerns With Nuclear Facilities And Other Sources of Radiation in the Former Soviet Union," GAO Report to the Honorable Bob Graham, GAO/RCED-96-4, November 1995, p. 23. Report done for CISNP, Kazakhstan Atomic Energy Agency, 7 July 1995. Sergey Borisov, "Ni zhuravlya v nebe, ni sinitsy v rukakh," Kazakhstanskaya Pravda, 2 February 1996, p. 3. Emily Ewell, "International Conference on Nonproliferation Problems," NISNP trip report, September 1997, KAZ970900, p. 11. NISNP Interview with Kazakhstani government official, 12 May 1997. "Transfer of the Research Reactor Highly Enriched Nuclear Fuel to Russia." 2nd International Conference on Non-Proliferation Problems, (Conference Brochure) Kurchatov, Kazakhstan, 14-17 September 1998, p. 14; "Fuel for Rocket with Nuclear Propulsion Shipped Out of Kazakhstan," Bellona: Nuclear Chronicle from Russia, September/October 1998, p. 14; "Nuclear Safety: Concerns with Nuclear Facilities and Other Sources of Radiation in the Former Soviet Union," GAO Report to the Honorable Bob Graham, GAO/RCED-96-4, November 1995, p. 23. Emily Ewell, "International Conference on Nonproliferation Problems," NISNP trip report, September 1997, KAZ970900, p. 12.